Featuring a patented luxury sliding mechanism. Available in Polished Chrome or Brushed Nickel finishes. Featuring a traditional hinged door with an unmatched style. Available in many colors and finishes. 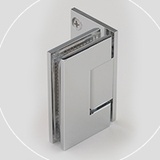 Featuring Oil Dynamic Soft Close Non Slam Hinges. Available in Polished Chrome or Brushed Nickel Finishes.